This Creamy Whipped Feta with fresh herbs is about to become your new obsession. Perfect appetizer as a dip or alongside roasted cauliflower as a side dish. Drizzle with Sepectrum® Organic Rosemary Olive Oil and you’ll really take it over the top and seal the deal! This post is in partnership with Spectrum® Organics All views, opinions, and love of good food are all my own. Thanks for supporting the brands we love. 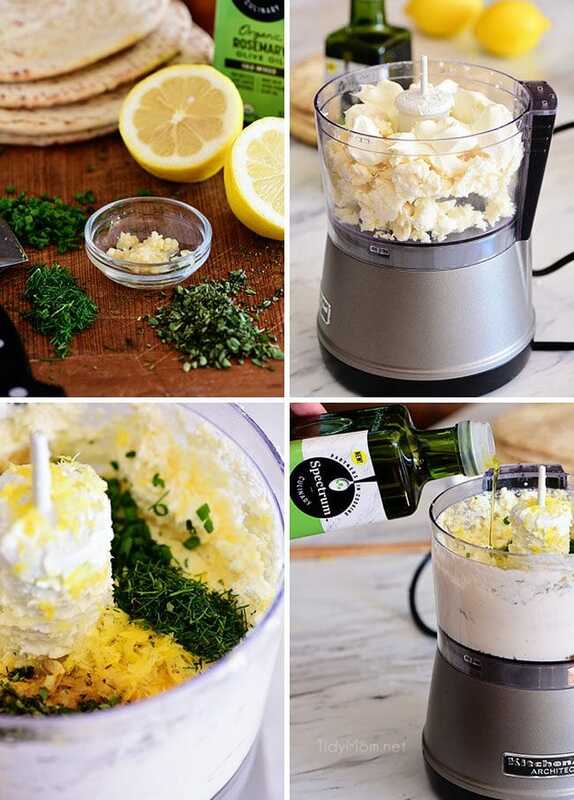 Instead of serving feta crumbled, it’s whipped in a food processor with fresh herbs into a gloriously creamy, tangy dip. A shot of rosemary infused olive oil drizzled over top seals the deal, making this a flavorful appetizer. It’s a spreadable dip when served fresh, and stores beautifully in the fridge for several days. The star of this recipe is the flavor Spectrum® Organic Rosemary Olive Oil provides. It’s is 100% organic and 100% first cold pressed, with a robust, fruity aroma and rich nutty flavor infused with rosemary. Spectrum® has an amazing line of natural and organic culinary oils and vinegars that features more than 30 varieties of seed, nut and plant oils including coconut oil. They always have what I need to take ordinary recipes to the next level and this whipped feta is certainly no exception. Oh, feta. I’ve only known you for a few short years, but now I’m wondering where you were all my life. You couldn’t be bothered to show up until my 50’s? In case you are late to the feta party too, feta cheese is a rich and creamy soft cheese of Greece made from sheep’s milk. The grainy, aged cheese has a salty and tangy flavor. Quite possibly one of the best things I have ever tasted. Feta is often touted to be a healthier cheese. It’s lower in fat and calories than aged cheeses and has more calcium and B vitamins than soft cheeses. It crumbles easily making it a popular choice in salads, on top of a pizza or flatbread, stuffed in a pita or as a selection on meat and cheese boards. Feta quickly becomes a dip for crunchy vegetables or pita chips by blending it with a little lemon juice and olive oil like the whipped feta recipe I’m sharing today. What’s In A Whipped Feta Recipe? 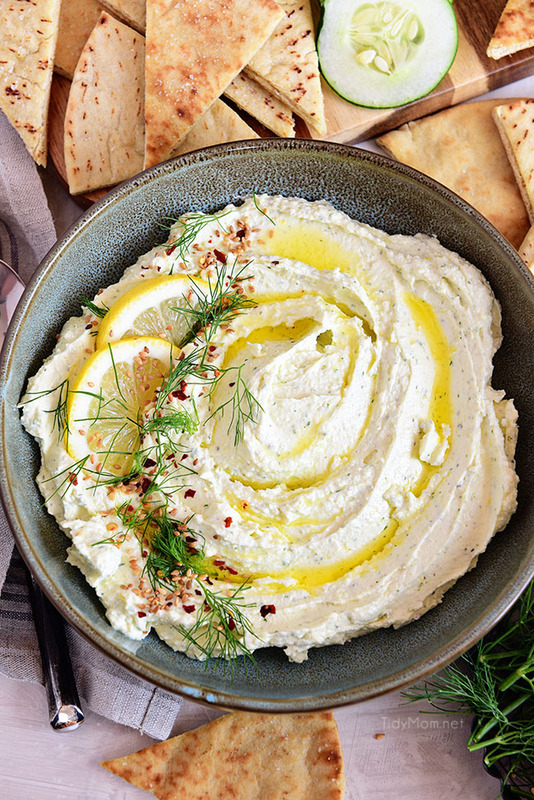 With just a few simple ingredients, whipped feta might be one of the easiest appetizers you can make. a block of feta cheese – let it come to room temperature for the best flavor. 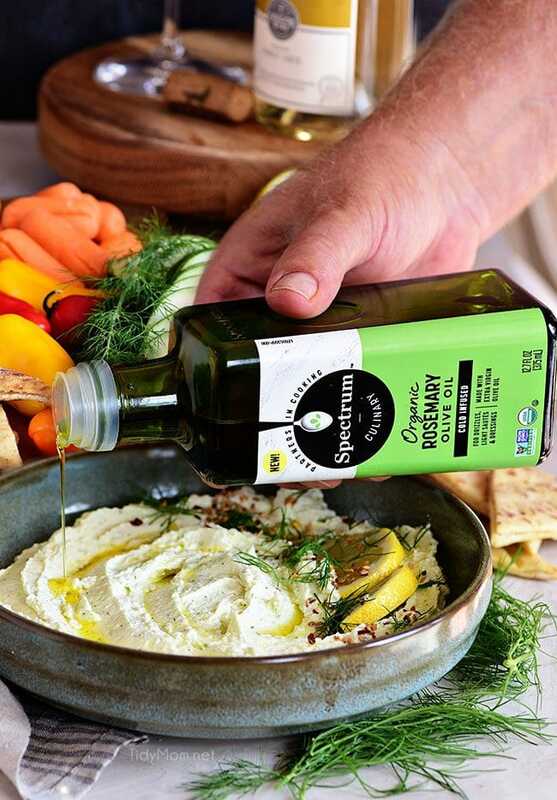 Spectrum® Organic Rosemary Olive Oil, adds a tantalizing flavor for a dip you can’t put down. fresh herbs – use what you like (or have on hand). I used dill, oregano and chives. Take my word for it, this simple creamy mixture is about to become your go-to dip or spread. You’re going to need a food processor, I use my little food chopper. Crumble room temperature feta and pulse until it’s fine and airy. Then add softened cream cheese and process until well-whipped (I pulse it for about 3-4 minutes), stopping to scraping down the sides of the bowl a time or two. Add a drizzle of Spectrum® Organic Rosemary Olive Oil and process for an additional 30 seconds. Add your chopped herbs, a little lemon zest, freshly squeezed lemon juice and salt and pepper. Note: feta is a brined cheese, go light on the salt….taste it and you can always add more if you need it. This was plenty creamy for me, but if you would prefer a creamier spread, add a splash of heavy cream. Everything can be adjusted to your taste depending on how tangy and how creamy you want your dip. 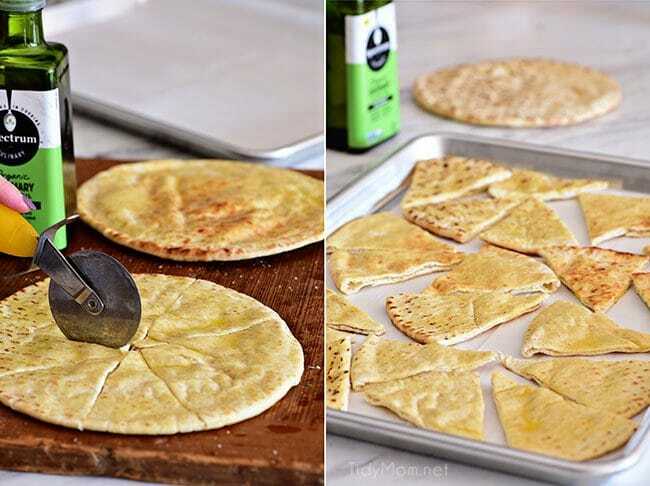 To make the toasted pita, brush the bread with rosemary infused olive oil on both sides and sprinkle with a pinch of salt. Cut each bread into 8 triangles. Place on a lined baking sheet and bake for 10 minutes in a 350°F oven. 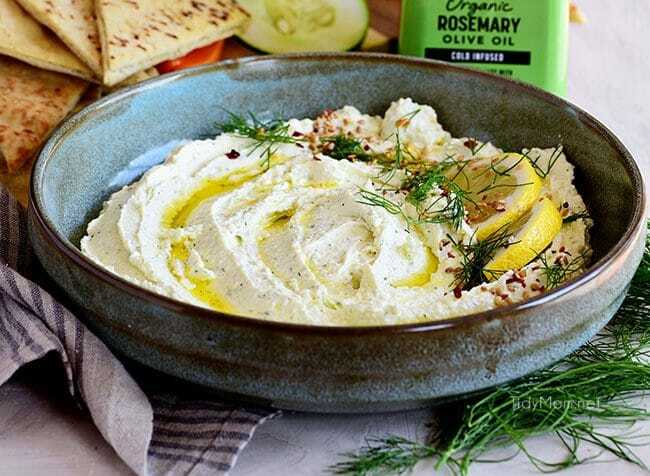 Make A Dip Platter: Eat it just like hummus pairing it with fresh vegetables and toasted pita wedges on a platter, and garnish with crushed red pepper flakes, fresh lemon and dill, toasted sesame seeds, and rosemary olive oil drizzled on top. 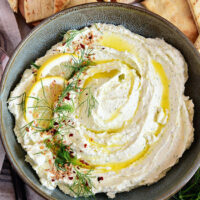 Spread On Your Favorite Foods: This whipped feta is soft and fluffy making it perfect to spread on just about anything. I love spreading it on top of a flatbread with some favorite topping and tossing on the grill. Or spread it on a sandwich. Create A Dressing: You can also add a few tablespoons of milk to the dip to make a sauce or salad dressing-like consistency. Mix It With Roasted Veggies: The best way to make your roasted veggies go from drab to foodie fab in a matter of minutes is to mix them up in a bowl with some of this cheese spread. I kid you not, you will be in flavor heaven! 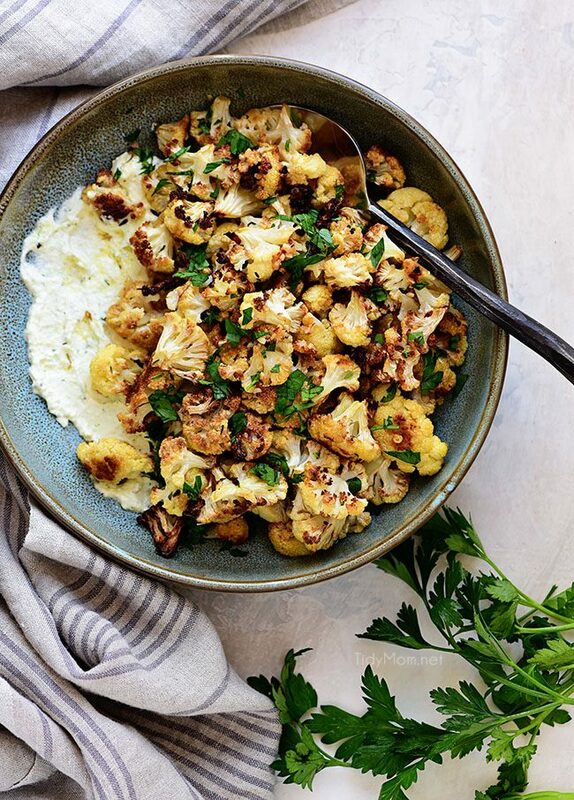 My favorite combo is roasted Cauliflower with the whipped feta recipe. This is definitely my new go-to appetizer. Now you just need to invite me over. Remember a few weeks ago, when I shared my Pumpkin Alfredo Ravioli I told you about a fun opportunity for YOU with Spectrum®. They will send one lucky winner and a guest on an 8 day trip to Barcelona, Spain during May 2019! 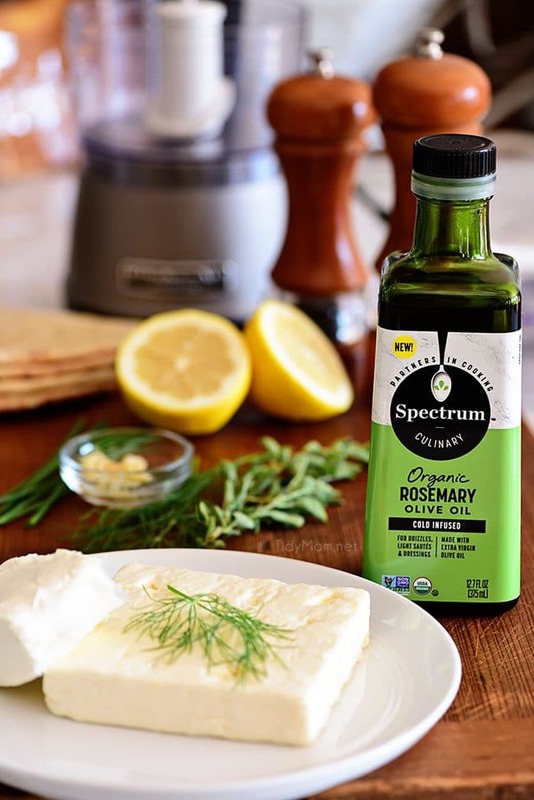 You have until December 15th, 2018 to enter and all you have to do is follow Spectrum® on Instagram or Facebook, post a photo of a recipe you made that uses one of their fabulous oils (like my creamy whipped feta or pumpkin alfredo ravioli), and let them know why you selected this oil including the hashtag #TasteofBarcelonaContest. So easy right?! You can find all the details and complete rules over at facebook.com/spectrumorganics. Butternut Squash Smoked Gouda Cheese Dip A delicious fall appetizer served in a gourd with buttery seasoned pitas, perfect for fall holiday entertaining. Ruben Dip This easy cream cheese dip recipe deconstructs a classic Reuben sandwich and turns it into a delicious hot Reuben dip! Caramelized Black Bean Spread This versatile recipe works as either a dip or a spread and has a sweet and toasty flavor thanks to the caramelized onions. Olive Spread This 5-minute spread is perfect for game day, an after-school snack, or a last minute bite if you have unexpected guests! 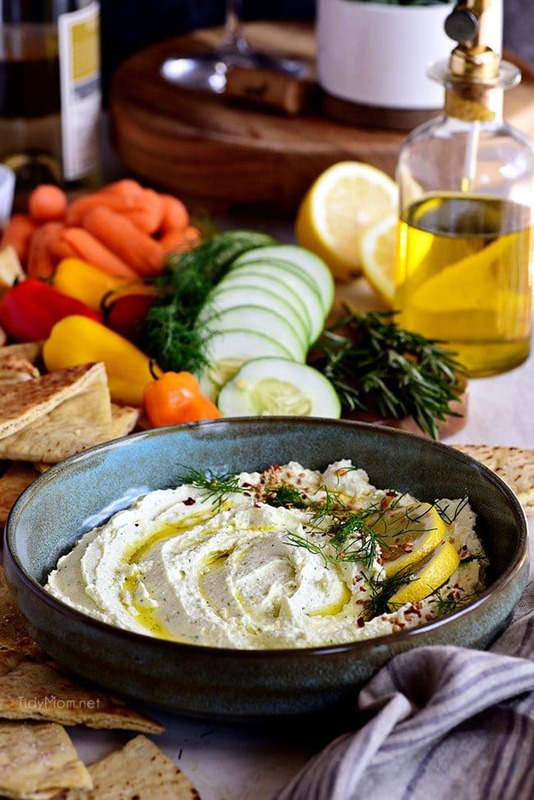 Like This Whipped Feta Dip Recipe? Pin It! This Creamy Whipped Feta with fresh herbs is about to become your new obsession. Drizzle with Rosemary olive oil and you'll really take it over the top! optional garnishes: toasted sesame seeds, red pepper flakes, fresh herbs and additional rosemary olive oil. Crumble softened feta into the bowl of a food processor. Process until light and airy, then add cream cheese and continue processing until well combined (about 3-4 minutes). if you would prefer a creamier spread, add a splash of heavy cream. Everything can be adjusted to your taste depending on how tangy and how creamy you want your dip. This looks so good! I’m always looking for new dip recipes to bring to tailgating! I think I might just bring this one on Monday Night! You’re right, this is about to become my new obsession. My husband ADORES feta and I have just have to do this for him! This will make the perfect appetizer for our get together this weekend! Perfect timing! I LOVE everything about this!! It’s the perfect appetizer!! YUM!! Wow!!! I love this recipe! I have always loved feta! Can’t wait to try this! 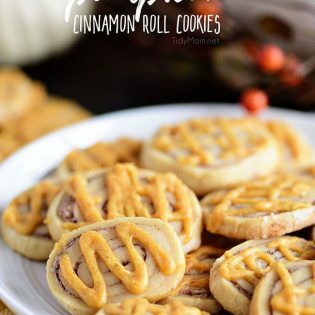 This is such a delicious idea- I love it! Wow great recipe, I like it! 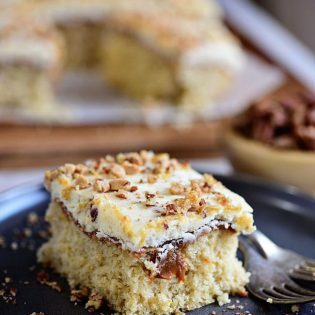 I would love to know more and more recipes from your blog!